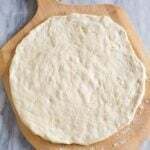 This basic Pizza Dough Recipe can make a thin crust pizza dough or a thicker, chewy pizza crust. 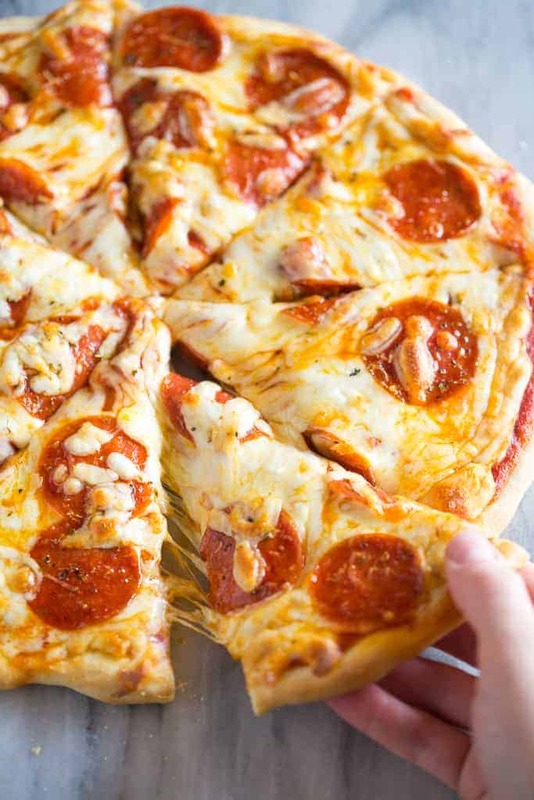 It makes a flavorful pizza crust that’s perfect for serving with any Pizza Recipe including: Pepperoni Pizza, Garlic Ranch Chicken Pizza, and Barbeque Chicken Pizza. Don’t forget to top it with my favorite 5-minute Pizza Sauce! 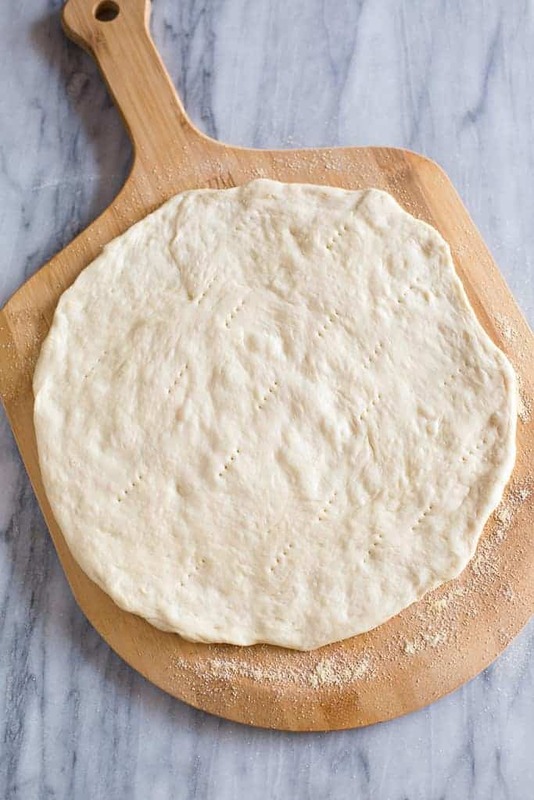 Everyone needs a good Pizza Dough Recipe in their collection, and this one is my favorite because it’s so easy and flavorful! Though I recently created a Wheat Pizza Crust that is phenomenal as well! I’ve been making homemade pizzas with my mom, ever since I was little. Once I got married, my husband requested them just about every weekend! But there was only one problem; I wasn’t in love with the pizza dough recipe that I had grown up using. SO, I set out to make the best pizza dough recipe out there. Now, for someone who makes homemade pizza on almost a weekly basis, I’ve had my fair share of trial and error, but I can confidently say that THIS IS IT! Dissolve the yeast in warm water with sugar and let it sit for about 5 minutes, to proof. (If the yeast doesn’t foam up like in photo step 1, then the yeast is no good.) Next, add more water, salt, vinegar, and olive oil. Knead the dough on a medium-low speed for about 7 minutes, then cover it and let it rise for 1 – 1 1/2 hours or until it has doubled in size. 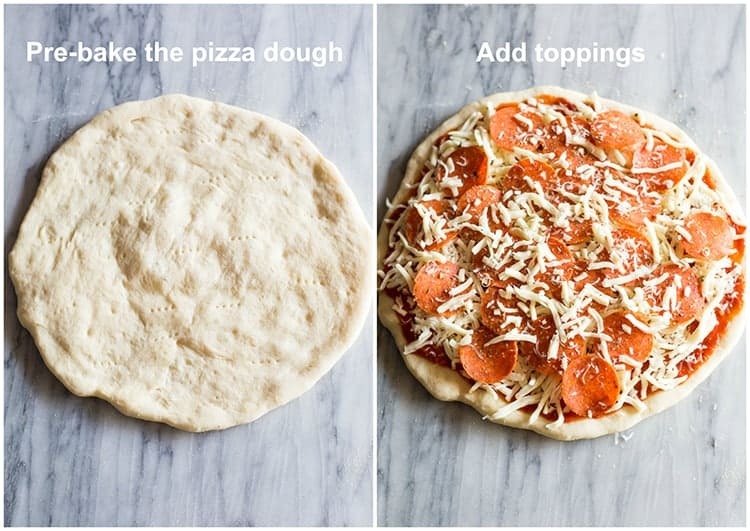 Divide the dough into 2-3 balls depending on whether you want to make thin crust pizzas or a thicker, chewy pizza crust. I personally like to divide my pizza dough recipe into three because I like the thin crust pizza. Spray your work surface lightly with cooking spray, or dust lightly with flour. Use a rolling pin or your hands to roll and stretch the dough to your desired size. Prick all over with a fork. Before pre-baking my pizza crust, I heat the oven with a pizza stone inside. If you don’t have a pizza stone you could use a baking tray (like a cookie sheet), turned upside down. If you are looking for an even healthier pizza dough recipe, check out my perfect and flavorful Wheat Pizza Crust! I’ve found that the key to making homemade pizza dough is pre-baking your pizza dough. It’s absolutely essential to pre-bake the dough for 5-6 minutes before adding your toppings. Once you’ve added Pizza Sauce and all your toppings, return it to the oven to finish baking! This will result in a crust that holds on it’s own and is crispy on the outside, and soft and airy on the inside. You really need to take the time to let the pizza dough rise. I’ve tried many “no-rise” or “15-minute” pizza crust recipes, but I don’t think any of them taste as good as this one. The only recipe I ever use when I’m in a hurry is this No Rise Pizza Crust, made with quick-rise yeast. You can also make the pizza dough the night before and let it rise in the fridge, in an airtight container, overnight, to save time. 3. What is the best flour for this pizza dough recipe? In the recipe I call for bread flour but all-purpose flour works perfectly well for this recipe . If you’d like to use whole wheat flour, check out my Wheat Pizza Crust Recipe! This is a basic pizza dough recipe, but you can spice it up to make it more flavorful. I sometimes add a couple dashes of garlic powder, dried basil, and oregano at step number 2 below. If you want to be a true Italian pizza artist, check out this tutorial on how to stretch your pizza dough by tossing the dough in the air! 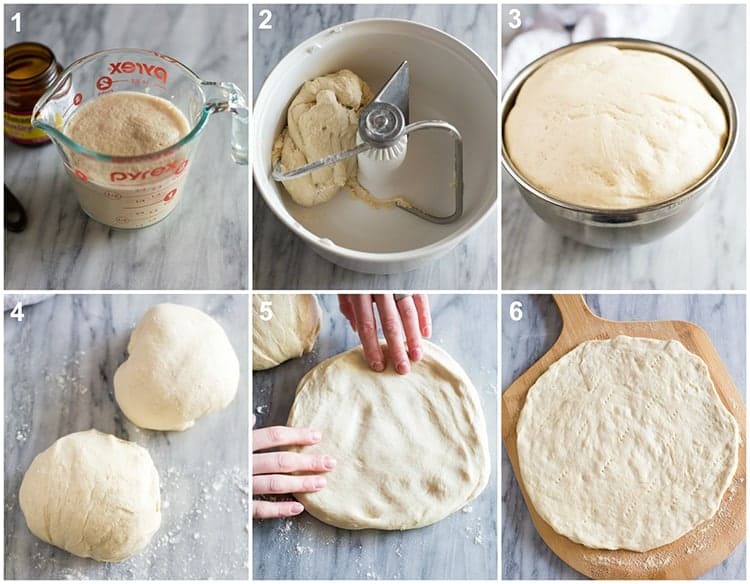 This pizza dough recipe make enough for three thin crust pizzas. If you don’t want to make three, you can freeze the leftover dough. Form a ball with the dough and lightly spray it on all sides. Wrap it in plastic wrap and place it in a ziplock freezer bag in the refrigerator for up to 3 months. To thaw, place the pizza dough in the refrigerator overnight and roll it out when you are ready to pre-bake. *I originally shared this recipe March 2013. Updated March 2019. What does the vinager do to the dough? It helps with flavor and boosting the rise of the yeast. This is IT. I’ve searched for a great pizza crust recipe and I’ve finally found it, and it’s easy to boot! This crust is soooo DELICIOUS. Words cannot describe it accurately. I am curious about one thing, how would it taste if I put it in an oiled pan and made it pan style? Thank you so very much for the PERFECT PIZZA RECIPE. Thanks Rose, I’m so happy to hear that! And that would definitely work 🙂 You could even just put cornmeal in the bottom of the pan. Excellent! We are always trying pizza crust recipes and this one did not disappoint! ( while still frozen and oven is heating) then bake. Faster than delivery and so good!